Mid-February. Massillon, Ohio: One of the players, Tom, had brought a celebratory cache of cheap foam weapons – short swords, axes, hammers and even flails – along with his usual giant bag of fresh popcorn. The resulting silliness helped offset a little undertone of sadness to this particular Dungeons and Dragons night, because it was going to be this group’s last session, at least for awhile. I came to this group at Backlist Books as the new guy back on Sept. 7, 2011, and I was a little nervous. The only person I knew at the table was Fred, the store owner and Dungeon Master, and I hadn’t played D&D since summer 2010. It was already week three of the Lost Crown of Neverwinter adventure, so in the interest of saving time, Fred offered me a pre-generated character in the interest of saving time, so I took up the bow of Belgos, a drow ranger. Belgos was an enjoyable enough character to play, although I feel like I approached him a little coldly – leveling up was all about how he could get better in combat, and I was always more focused on doing well in battle than in actually role-playing Belgos. I’m sure that partly this was because I was the new guy in the group, and I was still getting to know everyone else, and partly because I really had no connection to my character. Over the course of Lost Crown, though, spending Wednesday nights with this group of people I’d just met became a fantastic, energizing, bizarrely comforting ritual. I’d get home from work, have dinner with Jenn & Kelsey, gather up my dice, pencils and books, and take the back roads over to Massillon. Most times, I’d listen to mixes of 1980s music, because it put me in what felt like an appropriate frame of mind. The early session was usually still wrapping up when I’d arrive at Backlist, so I’d sit down and pick something off the shelves to read, or sit on the couch in the front of the store, or, if one of our group was already there, say hi and catch up a little on everyday stuff from the past week. Our sessions were supposed to start at 8 p.m. We were all there on time, most weeks, and yet most weeks, by the time we all caught up with each other, had purchased books or new D&D minis, and stocked up on our snacks and drinks for the evening, it was still closer to – or well past – nine o’clock by the time we actually started playing. If I got home at midnight, I didn’t care: Wednesdays were fine, fine nights in my book, no matter how the dice had fallen. The group stuck together for the next 14-week adventure, Beyond the Crystal Cave. This time, though, I wanted to create a character all my own. Thus was born my tiefling hexblade, Azathoth (the first Cthulhu Mythos name I found upon picking up a Lovecraft book). The core of his origin tale came to me almost immediately, and fleshed out a bit more over time as I played the character. I may even write it out sometime in a short story format, just for fun. During the very first Crystal Cave session, as our characters got to know each other, I made a decision regarding Azathoth’s feelings and motivations, but I opted to keep it to myself and play it pretty close to the vest until about halfway through the adventure. When I finally did make the revelation, several weeks later – and I admit, despite the fact that by now I was really comfortable role-playing with this group, I wondered how it would be perceived – I was ecstatic that the reaction was amusement and support and a recognition that this would be fun to play out. Our final session was, fittingly, the perfect mix of combat and role-playing and ideal dungeon-mastering that tested our characters’ mettle, allowed for some dramatic heroics, and felt very much like the final moments of a good cinematic story than the end of a game. Example: My terrible dice rolls were a longstanding joke within our group, ever since Belgos once went for what seemed like weeks without managing to hit the broad side of a tavern with a single arrow. So when Azathoth unleashed an Eldritch Bolt (think “Force Lightning,” but, you know, from hell) that turned out to be the final boss death blow, it was a fun moment. 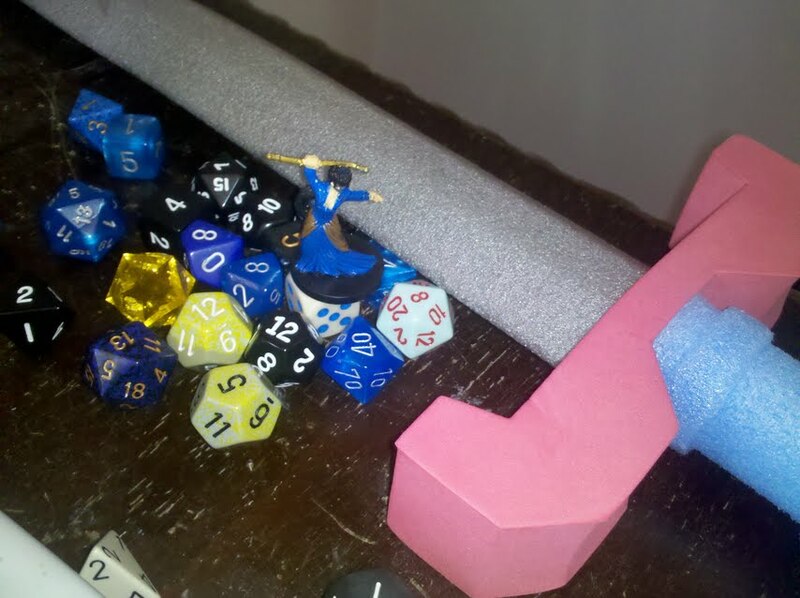 Fred the DM let me keep the figure representing the villain – and though I don’t collect D&D minis, that thing still sits here on my desk like a victory trophy. Even the post-battle story wrap-up presented opportunities for a few more truly enjoyable moments with our characters. It’s only been a month since then, but I have missed my Wednesday night Dungeons & Dragons sessions. I miss showing up, seeing my friends, stacking character sheets and dice on the table, popping open a Coke, and passing around Twizzlers and popcorn. I miss sitting down and creating, from the same elements in use by players and DMs all over the country, a story that is totally ours. I miss Azathoth, and the Nerdy 80’s movie and TV references, and my new friends. D&D is not so much about killing dragon’s as it is about creating and sharing a story. Well written Sir.